Feeling the weary road warrior (and I know I am far from the worst), I try to seek perspective from that which I experience. In the last couple of months it has been everything from Silicon Valley and the network of industry specialists in social commerce to Kosovo and discussions on social enterprises and change agents to family gatherings in New England, to workshops for leaders in US cable, to local (Malmö, Sweden) discussions on entrepreneurship and social leadership to Abu Dhabi to discover opportunities for knowledge sharing and advising on how social strategy can be used. My head is spinning, my heart is full and my body is worn out from flying cheap seats and changing time zones. But the real result is that I feel more inspired to continue my work and the importance on teaching social strategy. These activities, when laid out as I just have, may seem incongruous. In actuality they have a great deal to do with each other, especially when put in the global social context. 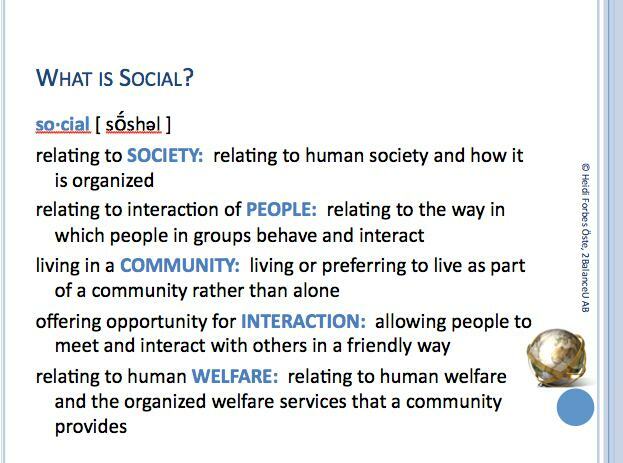 When we look at social from the perspective of people, community, interaction, welfare, humanity, and engagement, they have everything to do with each other. I often use these definitions when teaching to provide context to my integrated approach. Perhaps it will help here. After all, just like we as individuals do not have one role in life, social being related to people, does not either. Ultimately learning how to be more social and more effective socially empowers leaders and change agents in organizations, in communities, in corporations, in families. The greatest pleasure in my work is providing the clarity for those in leadership who have lost their ability to effectively be social in their efforts to succeed, for themselves and their organizations. Cultural change and being open to new ideas and sharing can be both exciting and frightening. Having a clear understanding of what we hope to accomplish, a strategy, is critical. Understanding our capacity to give and receive are essential first steps and can only be accomplished effectively if we take the time to learn about ourselves, our organizations and our true social capacity. Who are our champions, both inside and out? What are the limitations? Where are the opportunities? Take the opportunity to do an internal check first before assuming the barriers or opportunities lay on the outside. Several observations stand out for me in the last couple of months that provide clarity and perspective. In Silicon Valley among the social commerce professionals it was the excitement and passion for the possibilities, the perspective that “when” things happen, not “if”. Outside that community was surprisingly still the sense of superiority and the expectation that things will get back to “the way they were” without accepting that perhaps “the way they were” was not a sustainable reality. In Kosovo listening to the stories of successful business owners who “arose from the ashes” knowing that as long as they had their own two hands, they could provide and make a difference, I was humbled. In New England, I was thankful to be surrounded by my own community and strengthened by the importance of understanding my own story and network roots. A shared moment with a Livingston Taylor, a very talented American musician, lead to discovery of the beauty of following the beat instead of getting caught up in the instrument. I felt this was a beautiful analogy of social and the emphasis on engagement and impact rather than the tools. My leaders workshop was an opportunity to engage and help others to do the same and learn how to put that in a leadership context. Their smiles were my reward. My being brought there was a direct result of being present and updated in my own online social presence, as I was contacted by a classmate whom I had not seen in over 20 years, via LinkedIn. Back in Malmö, I sat at a table of amazing individuals who each came into my life through different paths; some personal, some professional. I marveled at the uniqueness of each, what they had to offer, and what I had offered them in the connectedness of that moment, and going forward with their businesses. We shared a passion for Amarossa Bella wines (not to be missed), for doing something for the greater good, for learning from each other, and for “being” in that moment. What a gift. In Abu Dhabi the meetings were inspiring in the interest and willingness to create new channels for collaboration and sharing of best practice MUTUALLY to provide new opportunities going forward. I was honored to be able to add value and share my knowledge. Not to mention, I tested my flexibility; culturally and literally. I realized through all this that my focus on writing the book has kept me from writing my blog, which of course is not good. I will try to be better in the future at finding balance in the two. I look forward to hearing your stories of where social opportunities have enriched your life, your business and your community. Previous Post: Did you mean what I heard? Thanks Beth! Great to hear about your successes with community building. Thank you for sharing your passion for Woods Hole and the area. I love seeing the updates. Keep up the wonderful work with your community and the inn. Cheers!